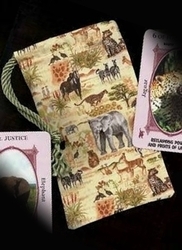 Wide Tarot Bags - Wild Horses Wide Tarot Bag - Tarot Bags, Tarot Cards, Cloths, & More! For many people, the horse is the animal that they adopt for their totem or power animal. This bag pays tribute to the wonderful spirit of that most magical animal. 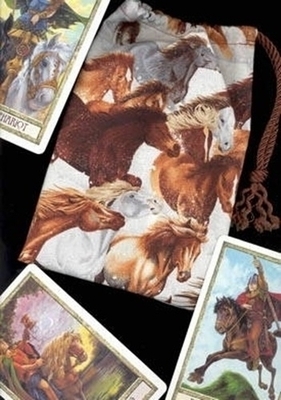 Of course, this bag is ideal for housing any deck that has horses in the illustrations as many of the Native-American themed decks tend to do. Actually, almost all tarot decks have horses on at least the knight cards. For example, the three Druidcraft Tarot cards shown here are illustrated with horses. Clearly anyone could use this bag to store any deck. It would make a perfect gift bag for a friend that is also an equestrian. If a standard sized tarot deck is stored inside it, then there is room for other items too. If the deck is an overly wide or tall deck then this should fit nicely. Size: Wide, approx. 5-3/4 by 9 inches.